See our newest LaserSwiss at MD&M Minnesota! Salon de Industrial with EMEC Machine Tools, Inc.
Montreal Manufacturing Technology Show 2018 Place Bonaventure Montreal, Quebec May 14 – 16, 2018 Quebec’s leading manufacturing event where professionals connect with peers, technologies and innovations. Visit EMEC Machine Tools Inc in booth #557. Click here to register. 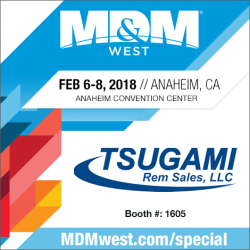 Tsugami/Rem Sales to Exhibit at Morris Midwest WI Grand Opening When: 05/02/18 – 05/03/18 9:00 AM – 5:00 PM Central Time Where: Morris Midwest 2323 Corporate Drive Waukesha, Wisconsin 53189 Click here to learn more about the event! Windsor, Conn. – July 20, 2017 – Tsugami/Rem Sales, the exclusive North American importer of Precision Tsugami machine tools, announced today the details of its WESTEC 2017 technology display, which features four innovative machines that are new to the event.